The combination of lace and intricate beading is a match made in heaven when it comes to short wedding dresses. This is not only beautiful to wear but on your wedding day the photographs will be amazing. As the beading catches the light it will gently glitter and sparkle nestled amongst the lace. We have picked out three beaded lace tea length wedding dresses below which feature this detail in different ways. 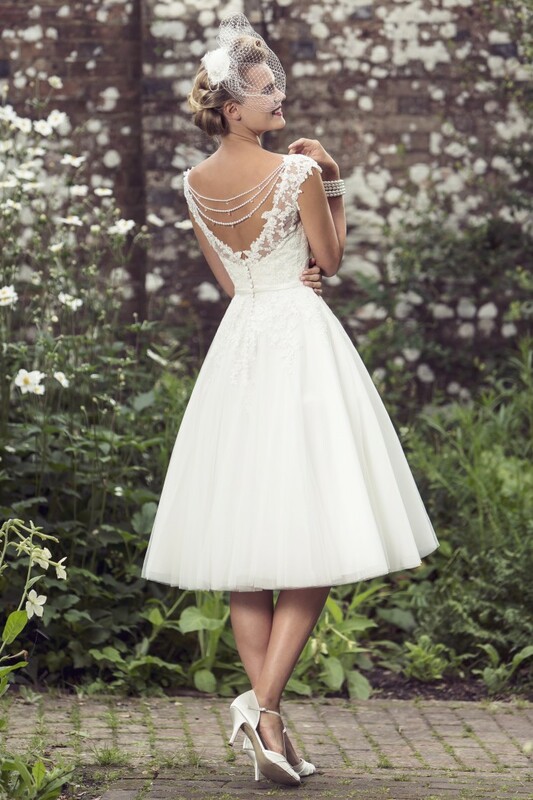 Lottie Featuring a delicately beaded lace bodice and full Fifties-style tulle skirt, this dress is ideal for the bride seeking something sassy and chic. A zip up back with button trim and a lace keyhole with beaded necklace detail finishes the look. Sybille by Loulou is a strapless satin tea length dress with a corded lace jacket. The beaded pearl clasp at the waist is a stunning feature . This allows you to change the look of the dress instantly by removing the lace and beaded jacket. Loulou bridal gowns are available in a range of beautiful colours including ‘ash rose, blue’ baby pink, mocha, vanilla, grey and more by special request. Gillian is a stunning tea length, vintage style wedding dress with long sleeves, by Timeless Chic. The beading is throughout the short wedding gown. It catches the light, sparkling and twinkling all day long. The v neck bodice and long sleeves are very flattering and this is a great choice for mature brides. For more wedding dress inspiration visit our Pinterest boards or our Facebook page. Why not book your one to one appointment in our Bexley Boutique we would love to meet you? 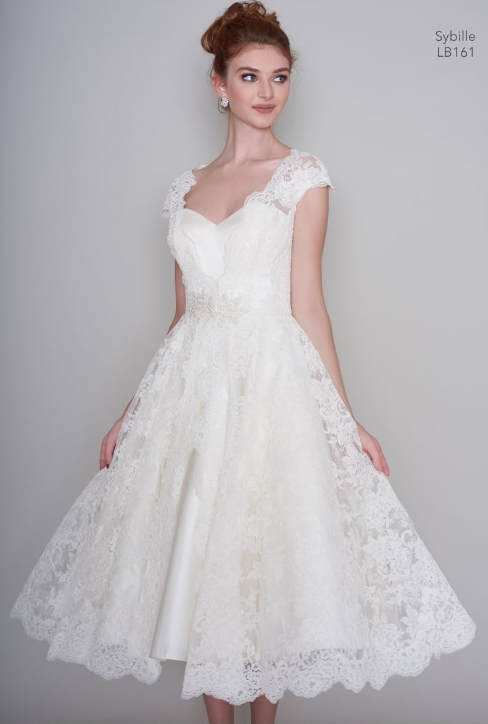 Our consultants are highly skilled in matching the right style of short wedding dress to the bride. There is no pressure and we work with you to find the perfect tea length wedding dress for you.